The University of Wollongong’s Sydney Business School (UOW-SBS), a Global Top 200 business school*, launched on Monday 28 October its first base in Southeast Asia in the heart of Kuala Lumpur, in a strategic partnership with INTI to meet the growing need for high quality postgraduate programmes by working professionals and to leverage on Malaysia’s position as a hub for Islamic finance. 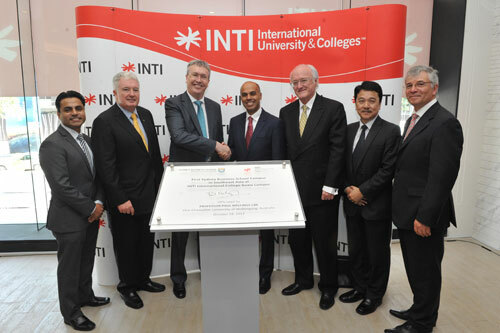 (from left) Rohit Sharma, Chief Operating Officer, INTI; Michael Mann, Managing Director, Asia Pacific, Laureate International Universities; Professor Paul Wellings; Amit Sevak; Miles Kupa; Jeffrey Goh, Chief Executive, INTI International College Kuala Lumpur; and Professor Joe Chicaro, Deputy Vice Chancellor (International), University of Wollongong at the launch of University of Wollongong’s Sydney Business School in Kuala Lumpur. The launch of UOW-SBS at INTI International College Kuala Lumpur (IICKL) in Menara KH, Jalan Sultan Ismail, Kuala Lumpur, marks an important expansion in the Asian region by the graduate school. UOW Vice-Chancellor Professor Paul Wellings, CBE, said Malaysia was selected as it was at the forefront of Islamic finance, an area in which UOW-SBS holds a strategic interest, and a potential market for educational consulting and training of financial planners. A graduate faculty of the University of Wollongong, which is in the top 2% of universities worldwide, UOW-SBS offers programmes taught by internationally recognised scholars in core disciplines of accounting, finance, management, operations, marketing and economics. It also offers innovative specialisations in areas such as executive coaching and leadership, business wellbeing and supply chain optimisation. The first cohort of students has been taken in for the August trimester. Officiating at the launch was His Excellency Miles Kupa, Australian High Commissioner to Malaysia along with Vice-Chancellor Professor Paul Wellings; and the CEO of INTI, Amit Sevak. “With the UOW-SBS MBA programme currently under way at IICKL, students have access to international academics and visiting lecturers who share their global perspectives and experiences. Teaching staff from Australia will deliver at least six out of the 12 MBA modules here in KL. UOW-SBS has also introduced the ‘Meet the Expert’ series here, which are presentations by experts and professionals on business-related topics. This is a great opportunity for networking and building connections between the students, UOW-SBS and the business community. Leveraging off INTI’s corporate and government networks, our future alumni will have access to the region’s top employers,” according to Amit Sevak. UOW-SBS is the first Australian business school to be accepted into the Global Business School Network, which aims to educate local managers and entrepreneurs in the developing world. As part of the network, which consists of 55 leading business schools spanning 26 countries, UOW-SBS is committed to sharing best practices and strengthening business education for emerging markets. The network provides UOW-SBS and its alumni, including those from Malaysia, with a wealth of networking opportunities across the globe.